Today, as with many other days, it is a rainy day in the city of Pittsburgh, the "Paris of Appalachia". It's rainy here pretty often despite the amazement exhibited by The Outcasts on their song about such things. This rainy day seems most appropriate for Hemlock for Socrates' barometrics, which the band describes as "an exploration of the variable humidity and dryness of certain word- and non-word sounds". I could end this paragraph with a dumb phrase like "let's get wet! ", but I won't do that to you. It's just depressing. barometrics has some cover art showing a road and overpass, seemingly here in Pittsburgh, through what seems to be a car window. The window is covered with rain. Rain is the theme here, so it all makes sense. The actual composition, the focus, and the text combined mean that the cover does not really mix together as would be hoped though. 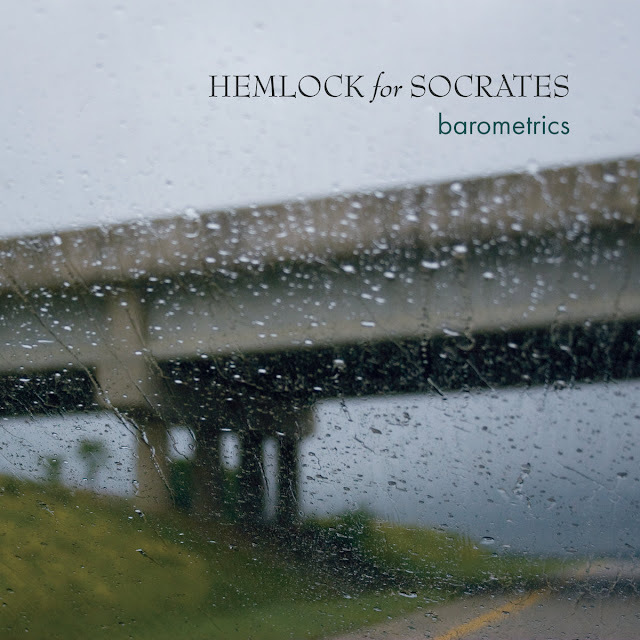 The first track on barometrics is “across your neck”, a song laden with gothic imagery and weather metaphors. The guitars reflect of shining background synths and a danceable rhythm section. The storm dies down on “stilled wind”, an operatic, minimalist piece of eerie dissonance that reminds me heavily of Nico’s The Marble Index. The instrumentation is dramatic, springing from sparse whispers into a rise of activity and back again. Track three, “fresh tape”, is a little more rock-ish though still damp. I don’t love the way the two singers interact here, but the big amoeboid synth helps balance it out. I started to notice an element of late-era Bowie as I got close to the end of this song. “hurt you this way” is sort of a fairy tale opera. It’s a little overdramatic, though the end wraps the track up in a nice, circular way. Side two starts with “come and gone”. It’s another dance-rhythm-driven track. These kinds of songs make me think of a more subdued Cactus Gamarra, a band that I reviewed last year. This track springs to life in the middle with some awkward synth horns. I am not a fan overall. “the forecast” presumably will include precipitation. This song gets all the parts right, vocals interacting with an unusual beat and shadowy, erupting guitar. Next is the “inclement weather” that was predicted. The showtune structure is corny. There’s more dynamic musical interludes, but the bombast has been done so many times on barometrics earlier. The metallic guitar is pretty cool, playing off of a buzzy synth and driving drums, so the song is not a total loss. “bite your tongue” is the last song with more of the lounge/goth drama. After so many tracks with these kinds of vocals, it’s really a downer. I like the synth/cymbal sound going on here, and the starry guitar and boxy drums make a nice sound together. As a whole, it’s a little too overcast, neither here nor there, for my liking though. barometrics is a quite a gothic, cabaret, production. It's a rainy theatre show that is too mired in the downpour for my ears. The songs are decent, but they churn and churn in the drain to a depressing level. It becomes a task to listen to this album all the way through, at least for me. I think the vocals are too much, too theatrical. The instrumentation is well done and well produced, but with the mire of the mix and the vocals going for the smokey room of a burlesque show, the songs do not reach the heights that they could and should. barometrics gets a Neutral.